Inspirational Christian gifts- God’s Word Collectibles. 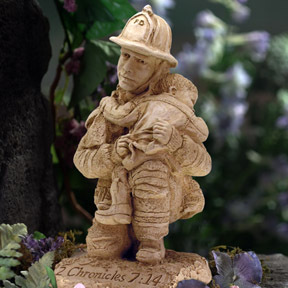 2 Chronicles 7:14 "If My people"
Home > God's Word Sculptures > 2 Chronicles 7:14 "If My people"
In recognition of those who put their lives on the line everyday and to those who have lost their lives in doing so. happens. There is a scripture that states "all things work together for good to them that love God, to them who are the called according to his purpose." Oftentimes it is hard to find good in anything tragic. But I know God can bring good to the surface. I have seen Him do it in my own personal tragedies. This sculpture and its scripture are for the prayers, for the heroes, for those who are trying to do a good thing in an inheritantly evil world. May I remind each of us that there is another part to this scripture, "seek My face, and turn from their wicked ways," Let us all agree in prayer that our country will seek His face, and turn from their wicked ways. For the rewards are great, He promises to forgive our sins and heal our land. 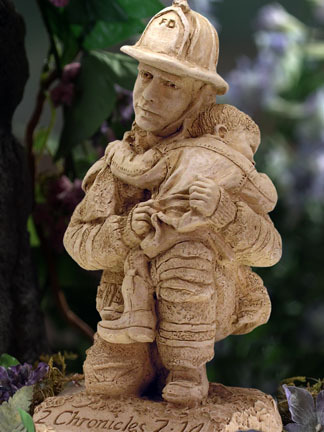 Bless the recipient of this sculpture, the heroes and those who are determined to pray. Please help us to do good, to not look at what others are doing wrong, but to focus on how we can seek Your face and turn from wicked ways. Remind us to be diligent in praying for those who put their life on the line each day, for those who are in authority over us, and for the leaders of our country. Help us to love those who pray differently and to show love always. Protect us from the enemy who is hiding amongst us.